The years-long effort to create a development framework for Northumberland looks set to be delayed further as a motion to withdraw and review the core strategy has been submitted. Despite the Northumberland Local Plan Core Strategy being submitted to the Secretary of State for Communities and Local Government for independent examination in April, the new Conservative administration now wants to take another look at the plan which will govern development in the county up to 2031. Council officers are also being asked to undertake a full review of the housing and employment numbers and strategic land use allocations. In the motion, members stress their support for economic and housing growth to support communities, as well as their commitment to the ambitions of the North East LEP strategic economic plan and North of Tyne devolution agenda, but they question whether the housing numbers contained within the current core strategy are required to meet these ambitions and wish to undertake a review and any required public consultation as soon as possible. However, there are risks to this approach, as highlighted in a report to the council, including the possibility of Government intervention in preparation of the plan due to the delayed timescale and also of speculative or unplanned development in the county while changes are made to the plan. There could also be the increased likelihood of planning appeals where the council has used the draft plan to resist development proposals. Some current applications may also require reconsideration by committee. 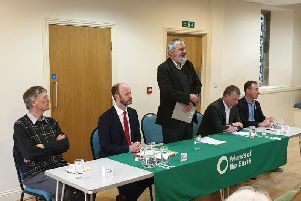 Coun Peter Jackson, leader of Northumberland County Council, said: “Our group has long questioned some of the assumptions which were used by the previous council in drawing up the core strategy. “Information currently available, and anticipated for release by the Government later this year, suggests to us that the requirement for housing in our county may very well not be as high as has been proposed previously. We want to use this information from Government and take into full account the latest regional plan in the form of the North East Strategic Economic Plan, to review the need to build on acres of green-belt land. The full council will consider the motion and the report at its meeting at 3pm next Wednesday (July 5) in County Hall, Morpeth.